As you may have guessed from the long kitchen remodel series I posted, when we first moved into our house, our attention was mainly focused on the inside. Tearing down wallpaper, painting, ripping up carpet, refinishing the floors, remodeling the kitchen, and updating a half bath all took priority over anything outside. But, we did do one small project for the outside within just a couple months of moving into our home. I realized I never shared it. We updated our address plaque for only $22! The old plaques (yes, plural – there were two) we old and rather ugly looking. I tend to love cool MCM stuff, but these were MCM in a bad way. Still, we wanted to maintain some of the MCM vibe, so I started looking for numbers that fit the era of our home. I found these light up numbers that I loved, but I didn’t love the $57 per number price tag. These numbers from Design within Reach were better priced, but still a bit more than I wanted to pay at $27 a piece. I found some numbers on etsy at a more reasonable $10 per number, but they only came in white or black (I wanted silver), and they were plastic. It seemed like I’d never find what I needed at a reasonable price. Enter Home Depot. Yes, Home Depot. 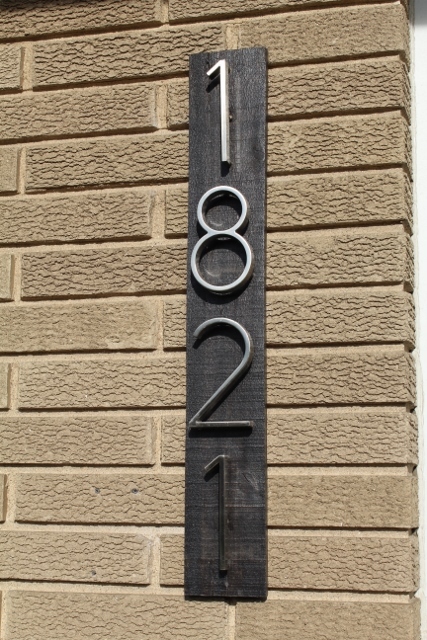 I was really surprised to see a Home Depot link come up in my google search of “modern house numbers,” but I clicked anyways. The link brought me to exactly what I was looking for! And at only $5.47 a piece, the numbers were certainly budget friendly. I was in luck, they had all four numbers I needed in stock at my local Home Depot. My wonderful husband, Dan, took time away from all the remodeling to make the new address plaque for me. He took a piece of pallet wood (I keep an old pallet behind our shed so the wood can weather and be used for projects), and cut it down to fit the space. He stained it (Jacobean by Minwax), sealed it, and then screwed in the numbers. He surprised me by finishing the plaque while I was out, and had it hanging on the house when I returned. It’s a small outside update, but I’m glad we took the time to do it. The curb appeal definitely went up a notch or two with this project. I have been meaning to put a new address plaque on our home. I love yours! This looks great and I am glad to know Home Depot has such cool numbers!